As part of the St. Francis Area Chamber of Commerce, you gain access to exclusive networking opportunities, seminars, and business referrals, as well as the opportunity to participate in community events and activities. Since our inception in 2003, the Chamber has worked hard to bring the diverse businesses of the St. Francis area together to promote and enhance the economic environment of northern Anoka County and southern Isanti County. As a member of the Chamber, you will have the opportunity to help us expand our organization and give your own business positive exposure. You will discover that membership in the St. Francis Area Chamber of Commerce is an investment in the future of our community and region. 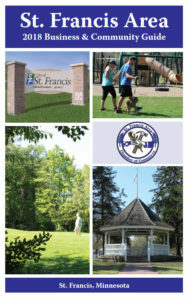 Click Here to read the St. Francis Area Chamber of Commerce Bylaws. The Chamber often receives requests for donations. Please read the bylaws, Article IX, Section 6 regarding this subject. If your request falls under the guidelines as stated in the bylaws, fill out this Donation Request Application and submit it to the Chamber Board of Directors for approval. Chamber Members: Do you have a suggestion? Do you want to help plan an event? Fill out our Member Suggestion Form and let us know how we can improve. The St. Francis Area Chamber of Commerce Board of Directors is committed to working hard for you, to maintain and improve our area’s economic vitality and represent the business community on local and state issues. The Chamber is run by a volunteer board of directors elected by the chamber membership. Various committees also help plan chamber events and activities. The Chamber employs a part-time service representative who manages the day-to-day operations of the Chamber. The Chamber makes a profit only through membership dues and two annual fundraisers. That money goes back into Chamber events and projects to benefit members and the community. The Chamber board meets the third Wednesday of every month at 11 a.m. at the St. Francis Community Center (next to city hall). Meetings are open to all. Visit the events page for upcoming locations. Tara Kelly (through 2021) – T. Bryce & Associates, Inc. Referrals – Business referrals are an important part of Chamber benefits. We direct residents and visitors to Chamber members when they are seeking products and services. Also gain access to exclusive member to member discounts. Networking – Regular meetings will allow members to network with other business owners to create lasting relationships and business opportunities. Seminars – The Chamber will host or co-host seminars of interest to the area business community, as well as the general public. Marketing – The Chamber provides mailing labels and current membership lists to aid members in their direct mail efforts. Your business is also listed in quarterly page in The Courier newspaper and on our web site. 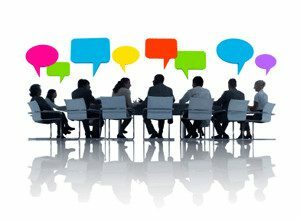 Community Pride – Only Chamber member employees can participate in committees – which is a great way for your business to be involved in the community. Become the driving force behind your community by volunteering your time and talents at a Chamber-sponsored event! Member Discounts – Chamber members enjoy exclusive discounts with other members. View the discounts. Any person, association, partnership or estate having an interest in the future of our community can join the Chamber. Member dues are $150 per year. All we ask in return is that you volunteer your time, as little as one hour a year, at a Chamber or community event. Complete the Membership Application Form Online and Pay Online with your credit card via PayPal. Contact us if you have questions or problems. If you begin your membership after Jan 15th of current year. Please use the Button below. Or contact the Chamber to have a form mailed or faxed to you. Once we receive your completed application and payment, you will receive a new member welcome packet that contains valuable Chamber information and a membership sticker to display in your business. The St. Francis Area Chamber of Commerce offers online payments for membership dues and other fees via PayPal. Click Add to Cart for the item you would like to purchase to be transferred to the PayPal web site where you can make a payment with your Visa, MasterCard, Discover or American Express. Login to PayPal if you already have a PayPal account. A PayPal account is not required.